Aimed at metro, light rail and tram wheel maintenance and inspection, the IDK Compact has a measurement base (distance between ball supports) of only 122 mm and the gauge can measure wheel diameters from 400 to 750 mm. With the same measurement performance as other RIFTEK’s IDK series wheel diameter gauges, this non contacting gauge provides accurate measurement to provide wheel data with a resolution of 0.01 mm. The measurement takes just a few seconds using a three point measurement principle where the gauge is simply placed on the wheel circumference in multiple positions and accumulated readings are averaged and displayed for rolling circle diameters. Capable of wheel diameter measurement up to 1300 mm, the range includes the IDK-BT version which features a Bluetooth output for connection to a supplied PDA or a PC for wheel-set wear tracking data storage. 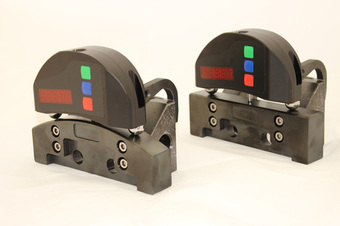 Other RIFTEK rail industry measurement systems available from Ixthus include wheel diameter and wheel profile gauges, disk brake profilers and back to back wheel distance measurement gauges. Available as portable instruments for use in almost any ambient conditions without wheel the need for wheel set removal, the range offers digital read-out displays or USB and wireless Bluetooth data transfer for comprehensive data acquisition. A range of dedicated software is included for full database support. RIFTEK also designs and manufactures optoelectronic 2D and 3D measurement devices and systems for a wide range of applications in industry and research.